Fresh off the easel, this is another colour study for a possible studio painting. I haven’t decided yet but we’ll see. 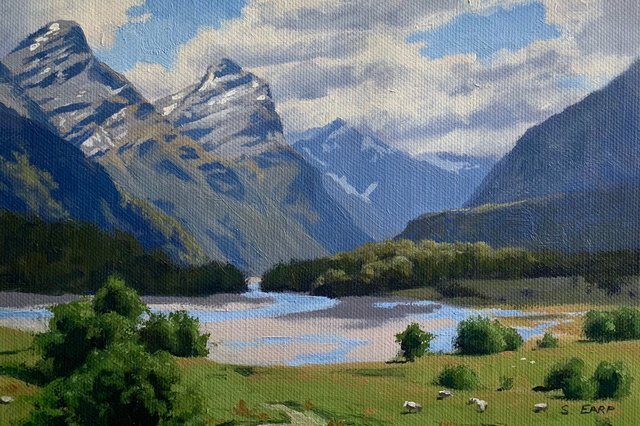 This painting is inspired by Paradise near Glenorchy, New Zealand, there are lots of high rugged mountains in this area. Thanks @ryivhnn, the colour studies are little paintings in their own right. I often frame them and I have sold many of them. And there's always cows 😉 really nice painting @samuel-earp-art 😉 you're such a lucky one because you can enjoy the view like this whenever you want 😊 I'm jealous. Thanks @cicisaja, it's a beautiful area of New Zealand. The animals are sheep in this painting, there are millions of them in NZ. I love animals and I like including them in my paintings, I've been doing it more lately. @samuel-earp-art You have received a 100% upvote from @botreporter because this post did not use any bidbots and you have not used bidbots in the last 30 days!